Library of Birmingham: Falcon protects library terraces Birds of prey are the latest contractors to work on Birmingham's new library in Centenary Square. 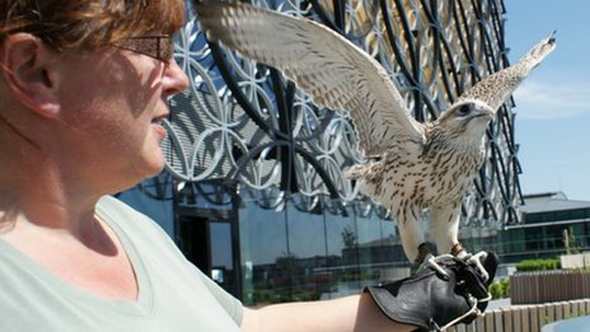 "> Birds of prey are the latest contractors to work on Birmingham's new library in Centenary Square. Birds of prey are the latest contractors to work on Birmingham's new library in Centenary Square. The council arranged for hawks and falcons to visit once a week to combat problems with seagulls and pigeons. The site includes two outside terraces and a meadow, which managers fear could be spoilt by nuisance birds. Ahead of its opening in September, Kim Martin has been bringing her birds of prey to ensure other birds do not settle there. "Visits could be more often once it's open and people are out there with food and things. "As it's a new build we just don't know and we'll have to see what happens with the bird population there", Ms Martin said. Ms Martin keeps 10 birds of prey in her Wolverhampton home and uses these for pest control on several buildings in the West Midlands. 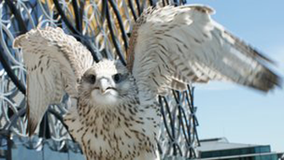 A hawk named Buzz is mostly used at the library, but she is also training a falcon called JD. "He was born on 18 May and I've had him since he was 10 days old. "His training is going well and this was his first day at work properly," she said. The presence of birds of prey is enough to deter other birds from settling on the building. Passers-by can tell when they are there by noisy gulls squawking alarm calls and circling around the site, said BBC reporter Faye Chambers outside the library. Kirsty Spence, from pest control company Contego, said: "Urban areas now need birds of prey pest control to address health and safety issues. "Birds can cause big problems blocking gutters, nesting on asbestos roofs, bombarding staff and making mess." Bird of prey flights will continue once the £190m library opens to the public in September, but are not expected during opening hours.